BioCell Collagen Reviews - Is it a Scam or Legit? BioCell Collagen is a blend of ingredients that promises to help replenish the natural loss of collagen as we age, leaving you looking and feeling younger. You may have seen supplements that proudly proclaim to include BioCell Collagen. The product can’t be bought by itself. Instead, BioCell Collagen is a proprietary blend of ingredients that can be found in many third-party supplements. But, what is BioCell Collagen and what does it do? We’ll take a look at BioCell Collagen’s claims, clinical trials, and reputation to learn if their patented composition can really help you look and feel years younger. According to BioCell Collagen’s official website, their product is both more effective and better tested than other supplements containing collagen and hyaluronic acid. According to the manufacturer, regular (unhydrolyzed) collagen exists as macromolecules with a molecular weight that ranges from 200-300 kDa. This results in poor solubility and bioavailability—the proportion of a nutrient that’s absorbed and put to use after digestion. Using hydrolysis, a process that involves breaking down molecular bonds using water, the size of collagen molecules can be reduced. Supplements containing BioCell Collagen feature this hydrolyzed collagen, and the company claims that these smaller molecules result in better absorption and higher bioavailability. By synergistic, they’re implying that hydrolyzed collagen type-2, hyaluronic acid, and chondroitin sulfate offer multi-dimensional nutritional support for skin, joints, tendons, and ligaments, resulting in easy absorption, fast action, and effective results. Joint Health: 89 Subjects who were experiencing joint discomfort were given 2 grams of BioCell Collagen per day, for 45 days. According to the website, 80 participants (89%) reported improved joint comfort and no adverse reactions were reported. Another randomized, double-blind, and placebo-controlled study gave 16 individuals 2 grams of BioCell Collagen per day, for eight weeks. When compared to the placebo, BioCell Collagen reports those who took supplements containing their ingredient experienced a 40% reduction in joint discomfort. A final study confirming similar results was published in a 2012 edition of the Journal of Agricultural and Food Chemistry. Skin Health: The first study enrolled 26 subjects who were undergoing both natural (chronological) and sun damage-related aging process in their face. Tools were used to measure both the quantitative (how many) and qualitative (how severe) wrinkles and fine lines shown on each participant. They were then given 1 gram of BioCell Collagen per day for 12 weeks. The reported results include improving both natural and sun-related signs of aging, including a reduction of fine lines and wrinkles (13.2%), dryness (76%), and an increase in measurable collagen content present in each participant’s skin. Additionally, no adverse reactions were reported. The outcome of this study was published in a 2012 edition of The Clinical Interventions in Aging. Again, BioCell Collagen can’t be purchased as a standalone supplement. Instead, those interested in testing out its potential benefits should look for third-party supplements that display the BioCell Collagen logo on their label. A list of brands that include BioCell Collagen in their supplements can be found on their Where To Buy page. Please note that each of the third-party retailers listed offers varying prices, shipping costs, and return policies. Additionally, the manufacturers of BioCell Collagen supplements don’t accept responsibility for the products or services sold by any of their third-party retailers. Are Collagen Supplements Good for Your Joints & Skin? BioCell Collagen might claim to deliver better results, but what’s up with the popularity of collagen in the first place? If your body doesn’t have enough collagen, all kinds of nasty side effects can occur. One such diseases, called Lobstein syndrome, results in exceptionally brittle bones. A lack of collagen also affects your body’s ability to synthesize vitamin C, resulting in scurvy—otherwise known as the least awesome aspect of being a pirate or 16th-century sailor. While it’s unlikely that you’re interested in BioCell Collagen to cure Lobstein syndrome or prepare for a lengthy sea voyage, we mention those two diseases because while they’re both caused by a lack of collagen—neither can be cured by swallowing collagen supplements. What does this mean? First, we gather that you can’t just pop a collagen supplement and expect plumper skin. Instead, your body needs to break down the protein before putting those amino acids to work. However, there’s a more important reason why supplements might come up short. So what if your body can’t tell the difference between collagen supplements and foods? Basically, if you’re not experiencing lessened wrinkles and joint pain from a block of cheese, there’s no reason to expect those results from a supplement. Gavura’s article isn’t about BioCell, but about another collagen supplement that makes similar clinical claims. His bottom line? Based on what collagen is, how it’s absorbed, and how we know collagen is actually synthesized in the body, Gavura states it’s highly implausible that 1200mg of additional collagen consumed daily will have any meaningful therapeutic effects. It’s worth noting that Gavura’s article inspired a heated debate in the comments, with one reader linking to research supporting collagen as a treatment for joint disorders. However, the research only examined existing studies and concludes that more research is needed to determine the effectiveness of supplement treatment. The Food and Drug Administration (FDA) doesn’t regulate supplements, providing that manufacturers don’t use wording that oversteps the boundary into what would be considered a “drug”—meaning that a supplement can’t promise to cure, mitigate, treat, or prevent a disease. In 2005, BioCell Technology received a warning letter from the FDA for doing just that. 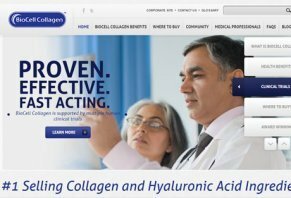 The warning letter cites several statements still seen on BioCell Collagen’s website, except that the mention of a specific disease has been removed. For example, the FDA takes issue with the claim that BioCell Collagen “improves the pain, stiffness, and quality of life in persons with osteoarthritis.” At the time of writing, that statement has been amended to state only that the supplement improves the feeling of joint pain and stiffness—notice the difference? This is important for consumers to note, as we often skim over the small words and phrases that allow brands to limit their liability while still implying that their products are as effective as medicine. BioCell Technology also adds weight to their claims by stating that both their proprietary blend of ingredients and processing are patented. However, according to a Quack Watch breakdown of common supplement claims, the U.S. Patent Office does not require proof that a product actually works. Instead, the main requirement is that it be different from previously registered products. As a consumer, the claims made by BioCell Collagen are tempting. Who wouldn’t want to feel and look younger by popping a supplement every day? However, despite the clinical studies provided on the product’s website, medical experts maintain that there’s no objective proof that collagen supplements are more effective than any source of protein such as meat, cheese, eggs or beans at restoring the collagen in your skin. Put another way, have you been more collagen-rich foods eased your joint pain? If not, there’s no reason to believe that supplements will do the trick. Further, medical professionals insist that the best way to get vitamins, minerals, and nutrients is through a balanced diet—and warn that you can’t supplement lacking components with pills. That’s not to say that BioCell Collagen supplements don’t work—just that, according to sources cited, those looking to boost their collagen should first look to their food choices. What if you follow certain dietary restrictions that limit the protein-rich foods you can eat? BioCell Collagen might provide some skin and joint benefits. But, to be on the safe side, we’d recommend discussing the supplements with your doctor before making a purchase. If you’re looking to boost your collagen levels naturally, without the use of supplements, be sure to eat plenty of protein. Additionally, antioxidants from brightly colored produce like tomatoes and grapefruit, fruits like oranges and strawberries, and veggies like broccoli and leafy greens can help improve collagen production and maintenance. And don’t neglect omega-3 fatty acids, which can help protect and heal skin. Finally, remember that BioCell Collagen isn’t available for purchase directly through the manufacturer, and to evaluate each third-parties claims and costs before purchase. My hands are 100% healed! Since my late 50's I have suffered with extreme cracking and bleeding of fingers and knuckles. I was treated with every kind of Rx, plus natural creams. Nothing worked, my fingers and knuckles were superglued, bandaged and constantly gloved. The pain was horrible as the fingertips were like raw hamburger, with really no outer skin on them. 16 months ago, I started Narrow Band Light Therapy on my entire body, EXCEPT my hands were gloved. This gave me 75% improvement, with still a few places super glued and bandaged. My hands were still so rough they caught on the bedsheets like velcro. Three weeks of BioCell Collagen and a miracle took place! 100% healed hands, soft and hydrated! I am wearing rings, and showing off my hands without gloves! I can not thank you enough for this product! I’m still waiting on my two bottles of BioCell Sport to be shipped from my order on September 3rd. I’m very hesitant to buy anything else. I contacted customer service via chat on Wednesday, September 5th, and the label was printed on the 4th, but now on Friday, September 7th, the package has not been picked up by USPS at their UT location. I have been taking these capsules for one week as directed. I’m surprised to say my findings are in absolute contrast to what is cited on this website. My skin is looking amazing, I look and feel amazing, and my joints and muscles do not hurt after my rowing training like they used to, and this is continuing to improve. I’m 56, and since I’ve been taking the capsules, my skin has shown an amazing improvement every morning all over my body not just my face. Wrinkles are diminished, my skin is hydrated and has a soft sheen, and sun damage, such as uneven skin tone, is correcting. I would recommend this product and have done so to my friends. My sister is a devoted customer of BioCell Collagen, and she hasn’t aged at all despite her hectic life. I am 9 years older and decided to try it as I have dry skin and am developing wrinkles at an alarming rate. I started a week ago using the powder mixed in my orange juice. I added two scoops instead of one to see if it made any difference. I have to say that I noticed a difference after two days. My skin seemed more hydrated and my wrinkles were softening. I had so much energy that I couldn’t nap at all during the day. I waited three hours before eating anything and wasn’t hungry. After a week I see an improvement in my skin tone and some of my wrinkles are GONE. Amazing! I have tried every cream out there and nothing worked, but I see a visible difference in my face. I am getting compliments, and I wasn’t before. Something’s going on, and I haven’t changed my diet so I have to credit BioCell on the changes I am experiencing. There’s no other explanation. I am convinced that this product is working and I will keep taking it and do another review later. There’s no taste, and it mixes easily into anything. I also take a vitamin C supplement with it as it is absorbed better. I love it! Which product did you use? What brand? Yes, which product did you use? I’ve seen capsules but not one that mixes into liquid. Thank you. Write a Review for BioCell Collagen!